Eight inches of fresh snow covered Sinking Valley. It was early in February 2011 and our son, Steve, and I were conducting our annual Winter Raptor Survey while my husband, Bruce, drove the car. I had been participating in the survey every winter since Greg Grove first started this statewide count back in 2001. When our son, who is a super birder with incredible eyesight, moved back to the area, I recruited him to sit up front next to Bruce, where he had a more panoramic view, while I retired to the back seat. Usually, he saw most of the raptors first and many more than Bruce and I had tallied in the early years. But on that morning, a bracing 19 degrees under a partly cloudy sky, the pickings were slim at first — an American kestrel and one red-tailed hawk. As the wind picked up, though, we counted more red-tails, another kestrel, and a northern harrier dipping low over a field. Then, we made our usual stop at an Amish store, and the owner told us that her ten-year-old son, David, who is a keen birder, had seen a mature bald eagle through his binoculars that morning. It was the fourth time he had seen one in the valley that winter. I looked and looked again through my binoculars and finally saw the white head and tail, which had blended into the snowy background. Steve set the scope up outside our car, and we all had an excellent view of the first bald eagle ever on our count. Even though it took Steve’s superior eyes to distinguish the bird, I had pointed out the “nest” and felt as if I had made a laudable contribution to our survey. In an age of uncountable losses in the natural world, the bald eagle success story bears repeating because three decades ago a sighting such as ours would have been impossible. And when the Pennsylvania Game Commission decided, back in 1983, to try hacking by obtaining young eaglets from Saskatchewan, Canada, where they are common, hand-rearing, and then releasing them in good eagle habitat, namely along the Susquehanna and Delaware river watersheds, no one would have predicted the incredible comeback of this charismatic raptor. In July of 1989, Bruce and I, on assignment for the now defunct Pennsylvania Wildlife magazine, visited Haldeman Island, one of two hacking sites in the commonwealth, with Jerry Hassinger, then the Endangered Species Program coordinator for the Game Commission. The two-and-a-half mile long, three-quarters of a mile wide island on the Susquehanna River, with its mixture of wetlands, fields and woods, seemed ideal habitat for bald eagles: close to the river yet secluded and protected from humans. We parked a distance from the hacking tower and quietly ascended the ladder leading to the nest compartments. There we watched as one of the three hackers, without being seen, fed five eaglets in two nest compartments. The eaglets eagerly consumed the live and dead fish the hackers fed them. Later, I peered through the one-way glass on the compartments and watched as the eaglets yawned, preened, or looked out over the top of their nest, through the front windows facing the river. Already their plumage was turning the dark brown of immature, a color scheme they keep until their fifth year when both sexes, the larger female and smaller male; obtain their regal white heads and tails. Although we had seen bald eagles in the Pymatuning/Conneaut Marsh area in northwestern Pennsylvania where a few pairs had nested even during the DDT years, the previous December we had had to travel to Maryland below the Conowingo Dam for superb views of numerous wintering bald eagles. So it was a privilege to see the eaglets at Haldeman Island and know that the summer before, a wild pair had nested successfully on both Hennery Island near Susquehanna State Park and in the Safe Harbor Dam area. Led by the pioneering hacking efforts of Pete Nye in New York state beginning in 1976, Pennsylvania, along with Massachusetts, New Jersey and Ontario followed suit, which greatly increased the northeastern bald eagle population through the 1980s and into the 1990s. But who would expect that in 2011, Game Commission biologists would know of at least 211 nests, 103 of which were successful, fledging a minimum of 165 fledglings. And, Patti Barber, a wildlife biologist for the agency, says that all those numbers are conservative. So far, 50 counties have bald eagle nests, but our county, Blair, is not one of them. However, having an adult bald eagle wintering in Sinking Valley, near the Little Juniata River, means that we could have a pair interested in nesting or already nesting. After all, in Pennsylvania bald eagles return to their nesting grounds as early as December through February when they engage in nest-building or repair, courtship, and breeding. Most eggs are laid between mid-February and mid-March. These nests are usually high in live large trees such as sycamores or white pines, close to a dead tree where they perch, and within a mile or so of water. Both sexes build their nest and take anywhere from four days to three months, interweaving sticks collected from the ground or broken off of nearby trees, lining it with finer woody materials and their own downy feathers. These nests are huge, among the largest of all birds, and are often reused year after year, by a species suspected to be monogamous and mated for life unless one mate dies. Courtship can only be described as ecstatic, featuring acrobatic flight displays, most notably the cartwheel display in which a courting pair flies high in the sky, locks talons, and tumbles down to earth breaking off at the last moment to avoid hitting the ground. Other courtship displays include the chase display, when a pair pursue each other, occasionally lock talons, rolling and diving, and the so-called roller-coaster flight, when one eagle flies high, folds its wings, and dives directly to earth, swooping back up at the last moment to avoid hitting the ground. After all that excitement, followed by breeding, the female lays one to three, dull white eggs in the nest and begins incubating after she lays her first egg so the young hatch over a period of several days. The male helps with incubation, although his brood patch is not as well developed as the female’s. Both parents step gingerly around the eggs, which didn’t help when DDT thinned their eggshells, causing them to crack open prematurely. After 35 days, the first youngster emerges from its egg, followed by its siblings on subsequent days. Both parents hunt and feed the nestlings, but the male does the most feeding the first two weeks while the female takes care of the nestlings. Unfortunately, the oldest, largest young gets most of the food and often the second and usually the third young starve unless food is abundant. The parents prefer large fish which they tear apart for their offspring, but they also haul in carcasses of fish, waterfowl and large mammals. 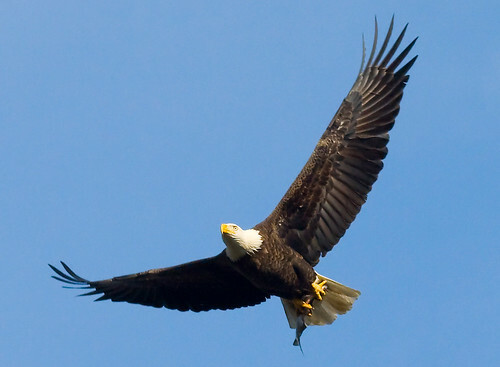 One study found that the diet of nesting bald eagles was 56% fish, 28% birds, 14% mammals, and 2% other prey. Another study, on the Chesapeake Bay, discovered that Canada geese and mallards were their most common bird prey and white-tailed deer (presumably carrion) and raccoons their favorite mammal meals. Gulls, ravens, crows, black bears and raccoons prey on bald eagle eggs. Nestlings are killed by black bears, raccoons, hawks, owls, crows, ravens, and bobcats. Siblicide is also common. The fledglings reach their full size in three to four weeks, and fledge anywhere from eight to 14 weeks of age. Even though they practice beforehand by flapping their wings across their nest and on to nearby limbs to strengthen their muscles, develop flight coordination and learn how to land, more than half the time they end up on the ground where predators may find them. Usually their parents continue to feed them there. The fledglings learn to hunt on their own by scavenging fish carcasses and picking up floating fish, although at first they follow their parents for food as long as six weeks after fledging. It takes them four years to attain adult plumage and they start breeding the following year. All things being equal, they can live more than 30 years but hazards, mostly from humans, sometimes kill them. These include shooting, trapping, lead poisoning, electrocution from power lines, and hitting other wires or vehicles. Perry County Wildlife Conservation Officer, Steve Hower, reported that last spring had been particularly difficult for bald eagles in his county and neighboring Juniata County. “One flew into a power line in Juniata Township, Perry County, and had to be euthanized, a second was found to be very sick sitting on the ground east of Mifflintown, Juniata County, and died shortly after it was captured; a third was found dead near Duncannon, Perry County, from an apparent respiratory infection; and a fourth was believed to be hit by a train while feeding on carrion next to railroad tracks near Newport, Perry County,” he said. But so many deaths are unusual. One pair in Pine Creek gorge that came from the original Sholola Falls hacking project in northeastern Pennsylvania celebrated 25 years in the same area last year and is now more than 30 years old. And you can’t argue with the nest numbers in the commonwealth. Originally listed as endangered in Pennsylvania, the Game Commission now classifies bald eagles as threatened and protected under the Game and Wildlife Code. Although bald eagles are no longer endangered or threatened at the federal level, bald eagles are protected by the Bald and Golden Eagle Protection Act and the Migratory Bird Protection Treat Act. 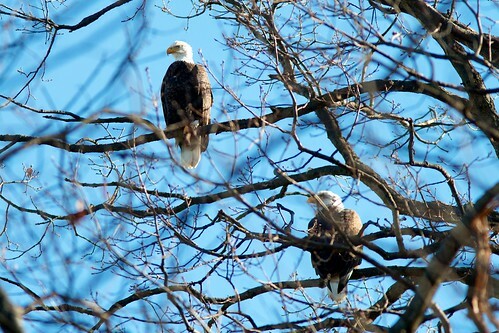 The Sinking Valley bald eagle was seen twice last summer by friends of ours. And we hope to see it during our Winter Raptor Survey this winter. Who knows? Maybe someone in Blair County will find a nest. If you find a bald eagle nest, please report it to the Game Commission by contacting them at pgccomments@state.pa.us and use the words “Eagle Nest Information” in the subject field. To learn more about bald eagles in Pennsylvania go to www.pgc.state.pa.us, put your cursor on “Wildlife” in the banner menu bar and then click on “Endangered Species.” Also posted are a series of guides entitled “Eagle-watching in Pennsylvania” that explain where to go, how to get there, and other wildlife viewing in that area.